Last night wasn't quite as bad as we thought it would be. Given the setup of our apartment, we were forced to accelerate the crate process and have Omar sleep in it. He'd seemed pretty comfortable with it through the day. We kept it next to the bed so he'd feel close to us. I guess it wasn't quite close enough though, because once we all settled in he started whimpering. I read the material. I knew what to do. "Omar, settle," I said in a gently commanding voice, while giving him a reassuring nudge through the crate. That's all they said you needed to do to get him to quit. He got progressively louder. His whimpers turned into weird, strangled howls. 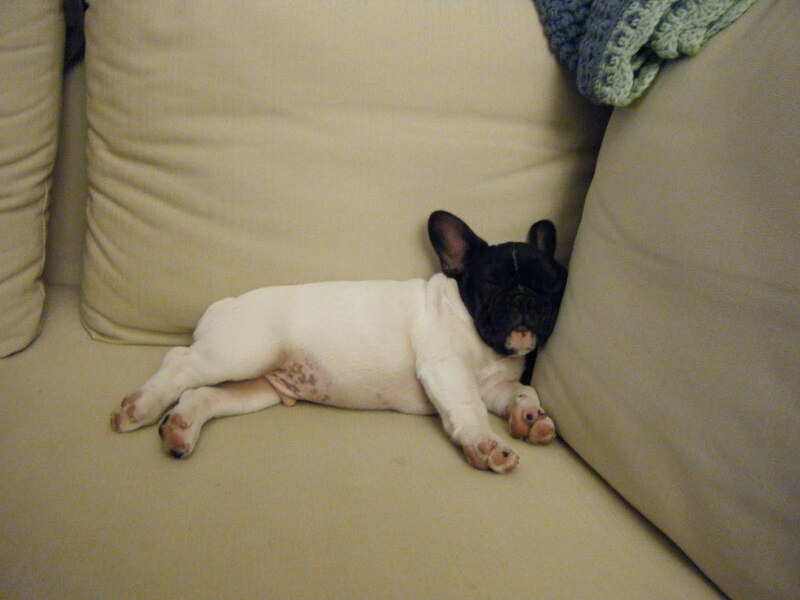 Frenchies are not known for resounding barks, which is one of the many things that makes them great apartment dogs. But I learned last night they are known for warbling, glass-rattling howls. Slightly less than my desire for him to stop so I could sleep, was my desire for him to stop so the neighbors wouldn't hear him. Amy got on the floor to settle him, and it worked. She got back into the bed, and in came the grunts and whines. She got back down, stayed longer, then came back. Again, the sounds of a puppy slowly being disemboweled. This time she brought her pillow and laid down a while. This went on until 8 AM. While our puppy certainly fell below expectations his first night, my certainty of his savant status has not diminished. Based on the brief reading I'd done before getting him, I was expecting worse. I don't know from where these dogs the authors spoke of came, but I have to assume they would all recognize Michael Vick on sight. We spent the day cradling him while he looked lovingly in our faces, playing with him with all the toys we bought him, watching him pee in every room of our small apartment, and marveling at the amount of odor that can fly off of one small dog turd.